When visiting beautiful Kefalonia in the Ionian Islands of Greece, a perfect must-see attraction is Melissani Cave, also known as Melissani Lake. Surrounded by forests and mountains, this fascinating cave contains a beautiful blue lake, almost iridescent in color. The cave is situated east of the Evmorfia and Agia Dynati mountains, in the village of Karavomylos, around 2 kilometers from Sami. This is one of the most important attractions of Kefalonia and is, in fact, a unique geological phenomenon, where a large section of the cave roof had collapsed, revealing the lake below to the sky. According to Greek mythology, the cave belonged to the nymphs, those divine spirits involved in the animation of nature and who loved to dance and sing. A nymph named Melissanthi was said to have drowned herself in the lake because her love for the god Pan was unfulfilled. In another story, Melissanthi was a shepherdess, searching for a lost sheep, who stumbled and fell into the lake. Whichever myth is the true one, the lake became a place of worship to the god Pan in ancient times and was rediscovered in 1951 by a Greek speleologist, Giannis Petrocheilos. Further explorations in 1963 showed that the cave is linked to an underground network in the island where sea water flows underneath the island to the lake, where it joins with fresh water, making the water somewhat brackish. 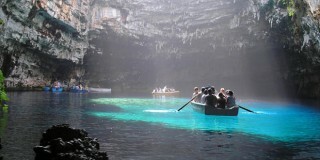 Melissani Cave and the lake are accessed through a tunnel in the rocks down to the water, where it is possible to take tour boats through the natural sculptures of many stalactites and to appreciate the crystal and beautiful color of the waters. The video included above takes the viewer on a brief tour of the cave. A memorable experience indeed on your Greek Island vacation.